We provide our services to the US Federal Government. TBG is an SBA-certified disadvantaged, woman-owned business on the GSA Schedule. This means we've met the Federal government’s rigorous pre-qualification standards, so you know you’ll receive high-quality service at a competitive price. We have experience managing no-cost, firm fixed fee, and time and materials contracts, consistently adhering to established timelines and budgets with high performance marks. TBG has a proven record working both as a prime and subcontractor in the execution of marketing, conference, event and trade show programs. We've worked with the Department of Defense, Department of Commerce, White House, National Marine Fisheries Service, and the National Oceanic and Atmospheric Administration on dozens of special projects. If you are with the Federal Government and are interested in working with TBG on an upcoming project, please click here. If you work with or represent a firm interested in partnering with TBG on a government contract, click here. TBG is an SBA-certified Economically Disadvantaged Woman-Owned Small Business (EDWOSB) and has been accepted into the 8(a) program. This means that federal purchasers can work directly with TBG through sole-source contracts without the need to go through a lengthy traditional procurement process. To view TBG's 8(a) sole-source guide, click here. TBG is proud to be a Prime Contractor under the Department of the Navy's NAVSEA SeaPort-enhanced (SeaPort-e) contract. The TBG team is committed to providing services and solutions to the department of the Navy and its commands via this vehicle. To read more about TBG and SeaPort-e, click here. TBG is officially listed on the GSA schedule under the AIMS 541 contract. 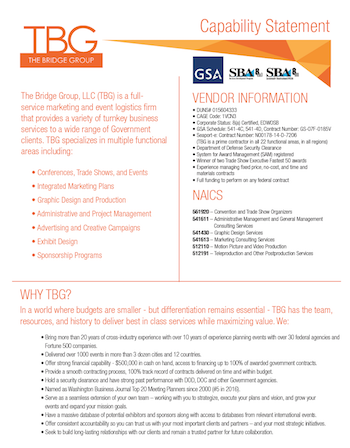 As a prequalified vendor, government agencies can leverage the talents of the TBG team by purchasing from our GSA price list. View TBG's current GSA contracts by clicking here. TBG also holds a Blanket Purchase Agreement (BPA) with the Department of Commerce. Click here for more information on TBG's current BPAs.